Purchase using the links above and any referral fees are donated to Kickstarter & Donors Choose. Thank you for helping to support these terrific causes! 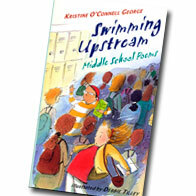 Award-winning poet Kristine O’Connell George, author of several successful picture books, now turns her attention to the middle school experience. The first year brings an array of challenges: making new friends, moving from class to class, tests and homework, changing for PE, gossip, school dances, and, of course, budding romance. Short, accessible poems in a variety of forms, but all in a single voice—that of a new middle schooler—evoke the memorable moments of the school year, exploring situations and emotions that will resonate with preteens. Lively illustrations complement this perceptive, humorous, poignant record of an important transitional year. Listen to a few the sixty-five poems that tell the story of a girl's first year of middle school. See Poetry Aloud! to listen to more poetry. NOTE: Your audio will play once the white ring circles the player. The Amazing Middle School Poetry Quest Winning students' poems from one of my Internet contests. Use the video on Poetry is a Moment in Time as inspiration along with Tips for Poets: Observation too help your students write about their own middle school experiences. "George's pithy free verse is a pass in and out of the hallways of a tricky 'tween year... this book of poems reads more like finding a secret insider's binder full of small distractions and successes. Any middle-schooler reading this will feel less alone, and any adult reading this will remember the days. A graceful gathering of thoughts, and booklovers, don't miss the tiny treasure of a poem "School Librarian" tucked inside! "This collection of poems, affirms the status, albeit sometimes shaky, of the middle school student: worried about new friends, homework, the combination lock; giddy and silly, but with an awakening concern not only about self but also for others—the slow student, the stutterer, friends, snobs, and did her report on the teen-aged martyr, Joan of Arc, do her justice. George captures the humorous, the humdrum, and poignant events in the lives of ordinary middle school youngsters." Mary Hurlburt Cordier, Associate Professor Emerita, College of Education, Western Michigan University.